LAWSON, Mo. — A Facebook post is causing quite a bit of commotion in the small town of Lawson, Missouri. 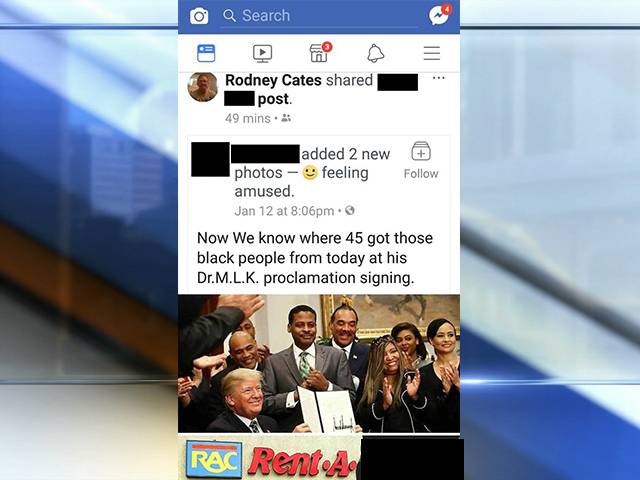 Rodney Cates, the deputy chief of the volunteer fire department, said he accidentally posted a photo to his timeline that had a photo of President Trump surrounded by a group of African-Americans. Beneath the photo, there was a tagline with an offensive term. "Normally my friends, my African American friends and I kid about the Trump jokes," said Rodney Cates. Cates said he was not trying to post it on Facebook. He actually thought he was saving the meme to show to his friends at work. He said the photo of the president was out of the ordinary and that's why he was going to show his friends. "I thought the way we joke, they would get a kick out of that," said Cates. However, not everyone thought it was as funny as Cates. "Their opinions should not be flashed anywhere, Facebook, emails, nothing," explained Teresa McNeely. 41 Action News spoke to one resident who said he has lived in the town for about 22 years. "People look different. It happens. There's nothing wrong with it. We are who we are," said Stephen Hobbs. Another man said he would have avoided the meme. "I wouldn't want to post anything like that," said Jeff Eidson. The fire chief said he is handling an internal investigation that the fire department board will also be apart of — leaving Cates to clean up an online fire. "I regret that. I didn't mean to offend anyone. I was just saving it to show my close friends that we joke back and forth with," said Cates. Cates said the post has been taken down and his sons will show him how to better use social media.